I am a woman on a mission at the moment. I’m going away tomorrow and I seriously don’t like food going to waste so I’m trying to eat my way through the perishable contents of my fridge. 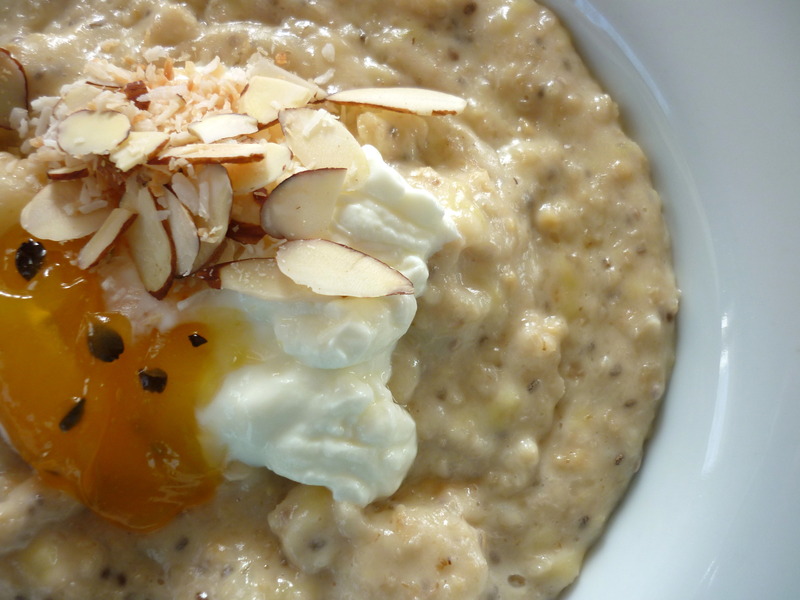 After surveying my fridge this morning I came up with this decadent porridge recipe. It turned out very sweet and creamy, reminding me of rice pudding. I topped my oats with greek yoghurt, passionfruit curd, toasted coconut and toasted, sliced almonds. I loved how the sweetness of the oat mixture was cut by the yoghurt and the toasted toppings broke the creaminess. I quite often have toasted nuts on my oats. It sounds like a lot of hassle but doesn’t need to be. Just chop them up and pop them in a small microwaveable dish. Nuke them a minute at a time until they are golden and you can smell them cooking. So simple and delicious. 1. Heat oats, evaporated milk, water, banana and chia seeds in a saucepan at a moderate temperature. 6. Pour into a bowl and top with yoghurt, passionfruit curd, coconut and almonds. If I make this again I think I would add sultanas in with the oats. You could also substitute the pineapple for mango. I couldn’t let this blog continue without any food pictures so here’s what I made for breakfast this morning. 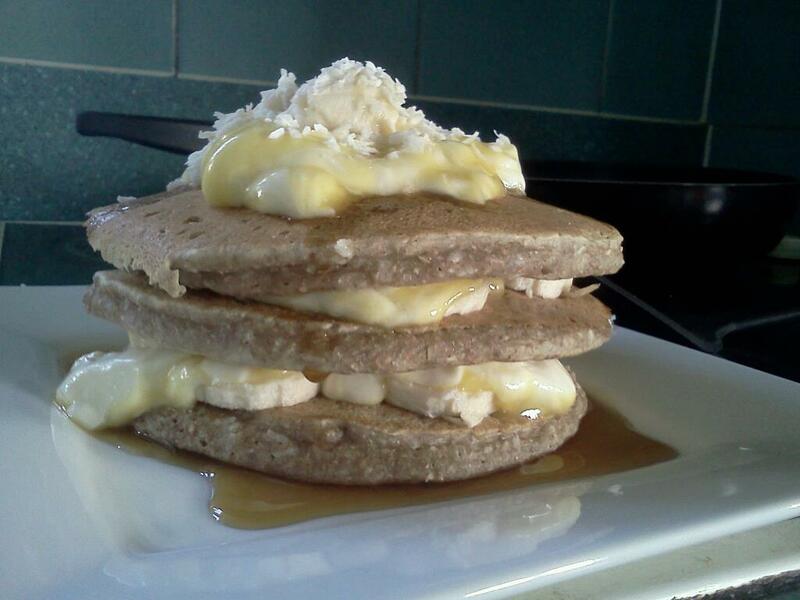 Yes, that is a giant stack of pancakes and yes, I ate them all. I used Angela’s for Blueberry Vanilla Pancakes recipe but obviously without the blueberries because I didn’t have any. The recipe states that it makes 6 medium pancakes so I halved it. It was probably a bit too much for one person so I’ll probably divide the recipe by 3 next time… … but halving it is just so much easier! The pancakes are layered with bananas, coconut, maple syrup and my new favourite supermarket discovery: Puhoi Valley Lemon Delicious Yogurt. It tastes so naughty – like you have spooned lemon curd through a creamy dessert. I swear I could eat this stuff spooned straight from the tub.